We’d love your help. Let us know what’s wrong with this preview of Twisted Innocence by Terri Blackstock. When Holly’s and Creed’s paths cross, Holly is unsure whether to be terrified of him or trust him. His tenderness with their daughter makes her want to believe his story that he had nothing to do with the murder. Then she discovers that Creed has a connection to Leonard Miller—who killed both her sister’s fiancé and her brother-in-law, and kidnapped her nephews—and things only become more complicated. To ask other readers questions about Twisted Innocence, please sign up. What other authors of this book are readers recommending? Cora I borrowed it from the library. Oh, this one was good! I love some strong character development, and this story takes us though a hero and heroine who have made some major mistakes with their lives but have to work through them to defeat the daring bad guy who’s plagued the sister MCs through this entire trilogy. This one’s my favorite of the three! Twisted Innocence was a great ending to the series. I liked how everything wrapped up and the author's note at the end was very good and true. I can't believe that I actually ended up liking Creed, but I did and I just wanted things to end up well for him. Recommend this series -- especially in audio format. I really enjoyed Twisted Innocence. It is the third book in a series, however, I had not read the first two books and I followed the storyline just fine. The author did a good job of catching me up to what had been going on in the previous books. I do think that my reading enjoyment would have been even greater had I read the whole series, but I still liked this book very much. I really liked Holly Cramer. She has turned her life around for the sake of her new baby. She no longer runs with a wild I really enjoyed Twisted Innocence. It is the third book in a series, however, I had not read the first two books and I followed the storyline just fine. The author did a good job of catching me up to what had been going on in the previous books. I do think that my reading enjoyment would have been even greater had I read the whole series, but I still liked this book very much. I really liked Holly Cramer. She has turned her life around for the sake of her new baby. She no longer runs with a wild crowd or parties her days and nights away. She is dedicated to this sweet baby girl and to doing the best she can for her. I sometimes found myself frustrated with Holly’s siblings, because they doubted that she had really changed her ways. But, truly, their reluctance to believe that she wasn’t going to fall back into her previous behavior makes complete sense. These siblings have known her the longest. The fact that she has made a permanent change is something hard to believe when they have seen her slip so many times before. There is a continuing story throughout the three books that deals with a powerful drug lord. I did not have any trouble following this plot. Holly’s family and other people close to their family have been brutally targeted and have had many problems because of this man. The continuing battle against his evil hold on their city was thrilling. This book flowed very smoothly and was a quick read for me. I enjoyed the plot and the characters and definitely recommend it for fans of suspense and romantic suspense. A special thank you to Zondervan and NetGalley for an ARC in exchange for an honest review. Talented Christian and crime writer, Terri Blackstock returns with the thrilling complex suspense Moonlighter trilogy, with an action filled, fast-paced thriller, TWISTED INNOCENCE (Moonlighters Series #3), focused on sister, Holly and her baby daughter. Of course, the sisters and other familiar characters are back for a novel of mistakes, love, and redemption. If you read Blackstock's last book Distort A special thank you to Zondervan and NetGalley for an ARC in exchange for an honest review. If you read Blackstock's last book Distortion (Moonlighters Series #2), focused on Juliet, and Truth Stained Lies (Moonlighters Series #1), focused on Cathy; you will be familiar with the characters introduced, as we have been anxiously awaiting their fate. In previous books we met Juliet, her husband, children, and sisters Holly and Cathy who all team up with PI Michael Hogan. Set in Panama City, Florida-wild child biker chick-like, Holly is trying to settle down. Now a mother of beautiful daughter Lily. As a single mom, she is working two jobs, trying to make ends meet with the PI business with her sisters, and a cab driver. However, as the book opens, the cab driver job becomes dangerous, when she is robbed by two meth druggies and wrecks her cab. Her sister Juliet is worried about her and wants her off the streets. She decides to get rid of the pink streaks in her hair and cover her tattoos, to be a responsible mother and give up loser boyfriends. The worst possible timing-- the father of her daughter, is back. Creed has a past and he happened to be a one-night stand (something she is not proud of and has not told anyone the identity). She does not want her family to know, as she is trying to live life on the straight and narrow, and she does not need the complications or a reminder of her past poor choices. To further complicate things, Michael is in jail (on a technicality and the girls are working hard to get him released, before Cathy’s wedding – blogger sister Cats Curious, from Book #1). And their worst nightmares come to life with Leonard Miller. The drug kingpin and murderer responsible for Cathy’s husband’s death, and Michael’s brother, kidnapping, among other horrific acts. He is back in town. Due to a woman’s testimony and the defense attorney’s focus, the jury had reasonable doubt about the police department’s integrity and found Leonard not guilty. After the trial, Michael was convicted of lying under oath. He lost his job at the police department since as a convicted felon, he could no longer carry a weapon. Needless to say, Miller went on to kill other as he climbed the ladder of his deadly drug trafficking ring. When Michael Hogan later took up arms to save Juliet and her children from Miller’s murderous cruelty, he violated probation. The hero did not fight the charges and his marriage proposal to Cathy came as they hauled him off to jail. Of course, due to all this injustice, Cathy quit practicing law. While Cathy and Michael are planning the wedding, they have bigger fears. She is praying Michael will be released as they need him to help track down Miller before he kills again. He lost his police career trying to save them last time. Miller is wanted for drug trafficking, distribution, conspiracy, kidnapping and murder and he would be insane to show his face; however, as Michael’s mentions, these guys are not so smart. Plus Holly has to worry about Creed and now Holly’s baby is caught in the crossfire-a bomb, a shooting, drug dealers, and lives are on the line as the intensity, tensions, and emotions are high. Is Creed connected to Miller? Will Creed save the day? Many twists and turns keeping you guessing the good guys from the bad. For fans of mystery, crime thrillers, suspense, romance, women's and Christian fiction. Even through Terri has been around for quite some time as a successful novelist, I only recently discovered her when I started reading this series. I was amazed how she seamlessly weaves many genres in one book, using flawed characters, highly charged subjects of drugs and crime and strong Christian faith. Well-developed characters and excellent writing, grabbing you from beginning to end. She demonstrates how all of us experience trials and are led astray, and how God uses the hard times for a bigger plan and purpose. God knows where we started and how we got there. 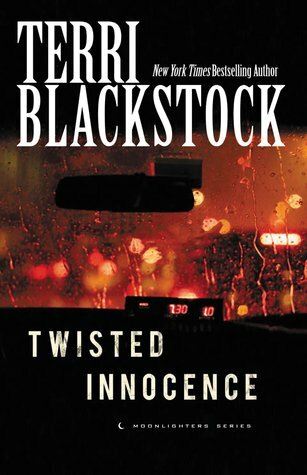 Highly recommend this series for an engaging and satisfying read and looking forward to reading more from Blackstock. As a fellow Floridan, loved the setting! Twisted Innocence is the final book in a trilogy, and the three books do need to be read in order, and (I believe) in quick succession, because Twisted Innocence builds on and concludes the overall series story arc. While I have read the previous two books, it was several months ago, and I had forgotten most of the details. As a result, I found the first quarter of Twisted Innocence slow, as though it was trying to tell new readers what had gone before without falling into an excess of backstory Twisted Innocence is the final book in a trilogy, and the three books do need to be read in order, and (I believe) in quick succession, because Twisted Innocence builds on and concludes the overall series story arc. While I have read the previous two books, it was several months ago, and I had forgotten most of the details. As a result, I found the first quarter of Twisted Innocence slow, as though it was trying to tell new readers what had gone before without falling into an excess of backstory that those who did remember the earlier novels would find tedious and unnecessary. There were good parts and bad parts to the story. The pace picked up once I got past the first quarter, which made it easier to read. The whole subplot about Michael in prison seemed unnecessary, as though he was only there so someone could observe one specific incident (the scenes where Cathy was petitioning to have Michael released were particularly tedious). Overall, while Twisted Innocence was a good finish to the series, it would be better if I’d read all three books in quick succession, as it didn’t work well as a standalone thriller. Thankfully, now you can, and for the same price as buying one of the books: Zondervan has released a three-in-one volume, and I'd recommend that rather than the single title. Another great book by Terri Blackstock. This book again confirmed why she is one of my favourite Christian suspense writers. The book was so fast paced I flew through it! This is book 3 of the Moonlighters series and what a great conclusion. In this book we get to know the youngest sister, Holly, as she struggles through accepting decisions she made in the past, and to realise it is only in the past, as well as getting to know Creed, the father of Holly's baby. Leonard Miller is also back and Cat Another great book by Terri Blackstock. This book again confirmed why she is one of my favourite Christian suspense writers. The book was so fast paced I flew through it! This is book 3 of the Moonlighters series and what a great conclusion. In this book we get to know the youngest sister, Holly, as she struggles through accepting decisions she made in the past, and to realise it is only in the past, as well as getting to know Creed, the father of Holly's baby. Leonard Miller is also back and Cathy, Micheal and Max is committed to find him and get justice for Joe's murder. What I loved about this book, except for the suspense which was page-turning and not predictable at all, was the way the author showed another character trade of God, which is also probably the most important one and difficult one to grasp = God's grace and forgiveness to us as sinners. I loved how Holly grew from the first book to the woman she is now in book 3. I also realised how we often are fast to judge people on past knowledge through Cathy and Julie's reaction to something that happened. Na drie delen even genoeg aan christelijke woorden. I had heard good things about this author and so jumped at the chance to review her newest, Twisted Innocence. I liked that even though this is the third book in the series and it would definitely be beneficial to read the first two books, I still followed the story just fine not having read them. It also had some romance, lots of family involved in the story (which I always like), and some decent suspense. I also liked seeing the different storylines come together as various characters found that their situations intersected. There were a few things that I didn't like in the story, unfortunately, since I really wanted to love this one. Holly does some things very uncharacteristically of a mother and, I felt, for her character. Then there were other pieces that didn't quite work for me. The love between two of the characters was much too fast and I also felt unlikely under the situation. Let me also talk about what I did like. I liked the characters. I loved how close Holly and her sisters and brothers were. They had each others' backs for the most part and had a lot to deal with between their past and current situations. There's a scene where one of the sisters who is raising her three children on her own and watching her sister's four or five-week-old baby and just about has a meltdown. It was completely crazy, but so realistic and it cracked me up. You see how great these women really are and the good men as well through some pretty tense situations. The story got fairly intense towards the end, as you would expect. Lot's going on there too. It also had a great message about change and wiping the slate clean in reference to starting over and letting go of past mistakes. If you've read Blackstock's other books or enjoy reading Christian suspense then I'd give this series a try. I wanted to connect more with the story, but still enjoyed reading it. Content: Some violence, as would be expected for the genre, but not overly graphic and I would consider this clean. This book was ace! pure ace! I started it last night and finished it this morning. I finished it whilst eating my breakfast, I just had to see what happened at the end. I've not read the books in this series previous to this, did it matter? nope, not one bit. I will go back over them though and see as I loved this book so very much. Holly seemed to have been a bit wayward, but since she had a one night stand with Creed Kershaw, a man that she was introduced to one night, drunk, and totally out of character, slept with him. She comes from a religious background, its not something she would uphold, and the consequences to this is, she finds herself pregnant. I am deliberately leaving out some bits and I don't want to give out any spoilers other that what you read via the blurb. Her path crosses with Creed again, under very unusual circumstances and she is forced to spend some time with the Father of her child, during this time, she sees a tender side to him when he is "fathering" and caring for their daughter.....but its HER child. All you avid readers will know where I am coming from, when you have a 'good book' in your hand you just can't put it down. Now can you! I hate to say it but this book was my least favorite in this series. The other two seemed more suspenseful and intriguing. This book does include the same characters from the previous stories, so I recommend reading them in order. Holly's character frustrated me at times but I liked Terri's portrayal of her life and situation raising a baby and being a cap driver. The most surprising person in this story was Creed who confused me at first and really completed the story line. Terri could have twi I hate to say it but this book was my least favorite in this series. The other two seemed more suspenseful and intriguing. This book does include the same characters from the previous stories, so I recommend reading them in order. Holly's character frustrated me at times but I liked Terri's portrayal of her life and situation raising a baby and being a cap driver. The most surprising person in this story was Creed who confused me at first and really completed the story line. Terri could have twisted the relationships up a bit but instead I think she made life more realistic and I liked it. I loved reading about all of the previous people and their continuing stories. I just didn't connect with this book much and for me it wasn't so much a page turner. I know so many people will love it though as I have the previous two. Terri Blackstock is a great writer and I can't wait to read more! Very fast paced and easy read. I liked getting to know Holly better in this book. Determined Holly Cramer's past choices have finally caught up to her, but she never expected them to endanger her baby. Determined to keep him out of their lives and turn him over to police, Holly uses her private investigating skills to search for him. But her bravado backfires when he turns the tables and takes her and the baby hostage. As desperate hours tick by, Holly realizes his connection to Leonard Miller—the man who has gunned down several members of her family. Creed claims he's innocent and that Miller is after him too. His gentleness with Lily moves her, but she can't trust a man who has held her at gunpoint . . . even if he reminds her so much of herself. The story was enjoyable but not as well written as the first two books in the Moonlighters series. Some parts seemed choppy and there were a few parts that repeated the same information earlier in the book. The writing seemed rushed (although it could have been me reading faster to see what happened the end). If you read the first two books in the series, think about reading this one. It rounds out the family story and the ending gave me a sense of peace for the family, even though there are fic The story was enjoyable but not as well written as the first two books in the Moonlighters series. Some parts seemed choppy and there were a few parts that repeated the same information earlier in the book. I raced through the final book and felt satisfied with the end. This is the 3rd book in the Moonlighters series. Holly Cramer is trying to get her life together. It is time to grow up and take responsibility for her actions. Being a single mom is hard, but Holly has no desire for the father of her baby to be involved in the picture. Creed has no idea he is a father until someone tells him about Holly having a baby. Framed for murder Creed is on the run. Hiding from the police and from the drug dealers that are out to kill him, Creed only wants one look at his This is the 3rd book in the Moonlighters series. Holly Cramer is trying to get her life together. It is time to grow up and take responsibility for her actions. Being a single mom is hard, but Holly has no desire for the father of her baby to be involved in the picture. Creed has no idea he is a father until someone tells him about Holly having a baby. Framed for murder Creed is on the run. Hiding from the police and from the drug dealers that are out to kill him, Creed only wants one look at his baby. In the meantime Cathy is still petitioning the governor to pardon Michael. Cathy and her sisters are working to keep Michael's private detective business open. Cathy is also busy planning their wedding for when Michael is let out of jail. When they finally catch up with Creed he has information that could lead them to find the man that killed Michael's brother Joe. Leonard Miller has no intention of being caught. With fingers reaching even into the police department lives are in danger and he is determined that Creed never speak to the police. Holly has made mistakes, one of which has left her with bills to pay and a new baby to support. Her sisters rally around to help, but it’s hard to trust they’re not blaming her with every incautious word. Then she gets mugged. So starts Terri Blackstock’s Christian romantic suspense, Twisted Innocence. Holly’s feelings for her child are achingly real – ”Holding her daughter was the biggest endorphin rush Holly had ever known.” Her doubts about her own self-worth will be familiar to anyone who’s e Holly has made mistakes, one of which has left her with bills to pay and a new baby to support. Her sisters rally around to help, but it’s hard to trust they’re not blaming her with every incautious word. Then she gets mugged. So starts Terri Blackstock’s Christian romantic suspense, Twisted Innocence. Holly’s feelings for her child are achingly real – ”Holding her daughter was the biggest endorphin rush Holly had ever known.” Her doubts about her own self-worth will be familiar to anyone who’s ever made mistakes—which must surely be all of us. But her eagerness to load her gun in self-defense is purely American, which might seem odd to an English reader like me. It makes sense though, since this is an American novel set in a world of private investigators, wrongly accused cops, drug gangs and murder. Many of the characters have been introduced in previous novels of the series, but the author brings her readers smoothly up to speed on what they’ve missed, while leaving enough details hidden to entice us to read more. Holly’s family has certainly had more than its fair share of troubles, but everything’s connected, and everything’s heading for an exciting conclusion in this tale. Christians are flawed but believable. Wounds, both spiritual and physical, hurt. And the scene where good sister Juliet declares she can’t sit at a bar—“What if someone from my church sees me?”—is delightfully fun, even as danger draws close. Unexpected love, unwilling trust … perhaps they mirror the love God wants from us. The author makes faith as real as the danger in this tale, and both are tested and well-described, over and over again, before the end’s in sight. As an English Christian reader, I struggle with the unquestioning approach to guns and punishment, but I really enjoyed the story. Disclosure: I won a copy and I offer my honest review. Twisted Innocence is the book 3 in the Moonlighters series. We first meet the troubled Holly Cramer in the first book. In the first book she has pink hair, tattoos and has an out of wedlock pregnancy. Her two sisters and brother do not know the identity of the baby's father. In this book we learn the identity of Holly's baby. Holly's baby is the result of a one-night drunken stand with Creed Crenshaw who is very much like Holly with his broken life. Creed also a good Christian upbringing but som Twisted Innocence is the book 3 in the Moonlighters series. We first meet the troubled Holly Cramer in the first book. In the first book she has pink hair, tattoos and has an out of wedlock pregnancy. Her two sisters and brother do not know the identity of the baby's father. In this book we learn the identity of Holly's baby. Holly's baby is the result of a one-night drunken stand with Creed Crenshaw who is very much like Holly with his broken life. Creed also a good Christian upbringing but somewhere along the line he decided to do it his way instead of God's way and got involved with drugs. When Creed first came on the scene I did not like his character but as the story came along I grew to like him more and more and really loved him at the end when he was willing to sacrifice his life for his child. This is probably the last book in this series since some storylines were wrapped up such as an evil one from book one. I highly recommend that these books be read in sequence. Terrific conclusion to the Moonlighters Series! The interwoven employment, families, and marriages sometimes leaves the reader holding his breath while turning the pages to see how just how much more convoluted their lives and troubles can get. What will be the final outcome? Will another lose his life? Whose heart will be torn asunder? The two protagonists of Twisted Innocence are Holly Cramer and David Creed. A year prior to the opening pages of Twisted Innocence these two were living on the wi Terrific conclusion to the Moonlighters Series! The interwoven employment, families, and marriages sometimes leaves the reader holding his breath while turning the pages to see how just how much more convoluted their lives and troubles can get. What will be the final outcome? Will another lose his life? Whose heart will be torn asunder? The two protagonists of Twisted Innocence are Holly Cramer and David Creed. A year prior to the opening pages of Twisted Innocence these two were living on the wild side, meet up with each other, and ended up with an eventful one-night-stand. As the pages open up, Holly has a four week old baby and David is in serious trouble with drug kings and the police. The secrets and the hide and seek are countless - or so it seems. Extended family involves Holly's sisters working as an attorney and also as P.I. 's Also, strong characters from previous books, Michael and Max are law enforcements and are totally immersed in the story. This is a fast paced, easy to read book. Contemporary Christian suspense well done. Thanks to Zondervan Fiction and Net Galley for providing me a free e-galley in exchange for an honest review. This was my first book by Terri Blackstock. This was definitely a GREAT read! I read it in one sitting and did not want to put it down. The suspense definitely kept me intrigued and interested. Drug dealers associated with the cartel can be callous and lethal and this one was pretty bad. Seriously. I mean who gets a one month baby involved? I do have to say there is a lot of religion goin Thanks to Zondervan Fiction and Net Galley for providing me a free e-galley in exchange for an honest review. I do have to say there is a lot of religion going on in this book, but I did not let it sway my opinion of the overall story. This was my problem, not the authors. I did skip several pages while the characters were praying. The action is nonstop in this story. We meet Creed, baby Lily's father. He and Holly sort themselves out as they seek to nab the kingpin of drug crime in their city. Juliet is soldiering on and a source of strength a d wisdom to her family. I liked the author's epilogue encouraging Christians to fight the spiritual battle. Twisted Innocence was the final book in the Moonlighter's series. Holly's story is a story of redemption and filled with life lessons. The story was a satisfying conclusion to this suspense series. Overall an excellent book. Wishing parts would have been a little more detailed and sad this was the last book in the series. I love this author and I love this book. I have yet to read one of her books that I did not like. I have loved all her books. Twisted Innocents is book #3 in the Moonlighters Series. In Twisted Innocents we get into Holly Cramer's story. Throughout this series Holly has been a character who has made poor choices and because of those poor choice she lands herself a job as a taxi driver. Motherhood finds Holly and gives Holly motivation to get back to a less dramatic and more fulfilling way of life when her baby’s father who is wanted for murder shows up in the picture. Holly’s character has always had an underlying feel Twisted Innocents is book #3 in the Moonlighters Series. In Twisted Innocents we get into Holly Cramer's story. Throughout this series Holly has been a character who has made poor choices and because of those poor choice she lands herself a job as a taxi driver. Motherhood finds Holly and gives Holly motivation to get back to a less dramatic and more fulfilling way of life when her baby’s father who is wanted for murder shows up in the picture. Holly’s character has always had an underlying feeling that her consequences would eventually catch up with her but little did she know that her baby would be caught up in her past mistakes as well. Holly is a character that I feel many people will be able to relate to in her struggles in life because we have all made mistakes and one of the best things about this book and series is you get to see Holly through all of those stages of sin, regret, and redemption. This story shows that God has plans for every single individuals lives not matter what kind of path we take or messes we get ourselves into. It’s never too late to pick up and live a different life but that can’t be done until we realize that we need God in our lives and that we can’t do it without Him. This is the third book in a series, however, it is not neccessary to read the other 2. This review has been hidden because it contains spoilers. To view it, click here. Plot was great, maybe some unrealistic elements just like the others in the series, but nonetheless it was good. I like the pure Christian values. What I didn’t like was how the reader is left with the impression that a baby and someone to love changes a man. That’s not usually reality. God can do anything, but our society is full of women thinking they can change a man with a baby and love, and while that’s not what Holly did people could feel that they too could get a similar happy ending if a Plot was great, maybe some unrealistic elements just like the others in the series, but nonetheless it was good. I like the pure Christian values. What I didn’t like was how the reader is left with the impression that a baby and someone to love changes a man. That’s not usually reality. God can do anything, but our society is full of women thinking they can change a man with a baby and love, and while that’s not what Holly did people could feel that they too could get a similar happy ending if a baby is involved. I still don’t like Michael and Cathy together. She was engaged to his brother until he was killed, now she’s married to his brother (the man who was going to be her brother-in-law). I haven’t been comfortable with it in any of the books. I’ve noticed that some of the descriptions in this series hint that the “bad guys” are minorities, which I’m not liking. If that’s not the case, awesome, but it’s felt that way with names and physical descriptions. Someone is puking in every one of these books, which is just ugh.